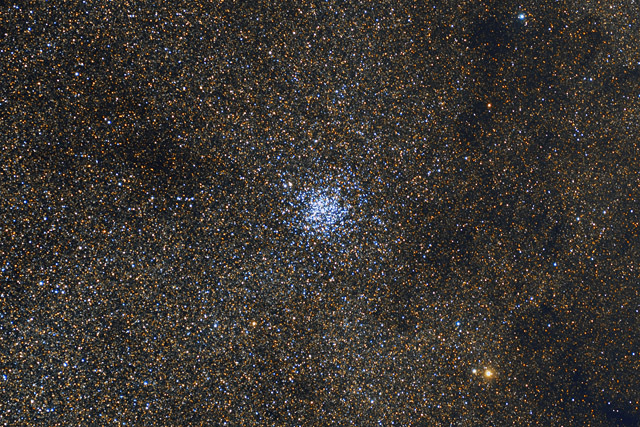 The cluster itself subtends an angle of about 1/4 degree, a fairly small portion of this approximately 1 1/2 x 1 degree field of view. In this image, North is to the right. This image was cropped to 40% of the original frame. Software Used Images Plus 5.75 for camera control. Images Plus 6.0 for calibration, stacking, ArcSinH stretching, star shrinking and halo reduction, smoothing and noise reduction. Photoshop CS5 used for levels and curves, match color, lab color, selective color, and cropping. Pixinsight 1.8 for color calibration. HLVG for additional color correction, Gradient Xterminator for gradient removal. Carboni Tools for additional noise reduction and smoothing, Focus Magic for focus restoration. Registar 64 for stack alignment, color channel alignment and registering. This image was published on page 10 of the August 2017 issue of Nature's Friend Study Guide. This image was also published by Astronomy Magazine as its Picture of the Day for April 17, 2019! !